The show centers on Amanda (Leslie Bibb), a former high school mean girl who’s forced to move back home to Dallas with her teenage kids after her husband dies amidst personal and financial scandal. As much as we love the "Ocean's" dream team that includes Brad Pitt, George Clooney, and of course Don Cheadle, the 47-year-old actor himself says the franchise has likely reached its end. "I think that was put to bed," Cheadle tells us of the possibility of another "Ocean's" movie. "And I think if we do bring it back, you know, we should do it in reverse. We should do 'Ocean's 9' next, and then eight, [and then] seven, and just knock off a character as we go down until there`s just two left. It should be a battle to the death." We'd pay to see that, but we're not holding our breath for a release date. And, unfortunately for Easy Rawlins fans, Cheadle's not going to portray Mouse on the small screen. (Last fall, there was a report that NBC was working on adapting the Walter Mosley character Easy Rawlins for television). 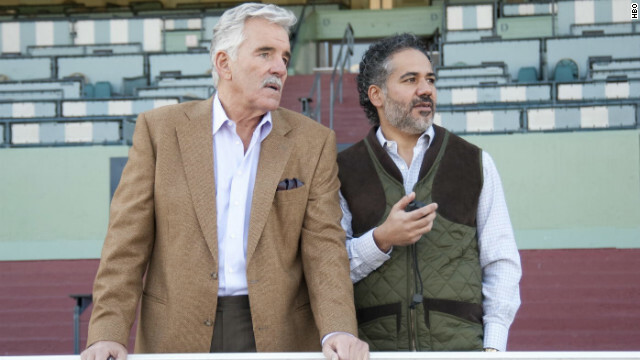 In a slow, prodding episode that featured two horse races but little else, Ace Bernstein and Gus Demitriou (played by Dustin Hoffman and Dennis Farina) provided the spark that drives "Luck" on Sunday, even as they drifted in and out of dreaming. So we’ve been down this road before: Everything in the world of Kenny Powers is awesome, until reality actually comes into play. Thanks to a stellar Matthew McConaughey cameo; a Russian with an awful haircut; and what appeared to be a heart attack caused by too much excitement from “Walk Like an Egyptian," with Sunday's episode I welcomed all of the tension, conflict and hilarity that is sure to come in the rest of the season. For starters, can I ask who styles Maria? My guess is an early 2000s/late ‘90s stylist, because her collection of FUBU and Rocawear would have been something to marvel at back in my high school days. Baby is set to make three for Nick Lachey and his wife Vanessa, as Nick's confirmed they're expecting their first child. The 38-year-old singer/TV personality revealed the joyous news while guest co-hosting on "Live! With Kelly" Monday. Vanessa, who wed Nick in July 2011, was on "Live!" back in January, and "later that night she started to feel a little different, not quite herself," Nick recalled.